the scent of green bananas: fried and prejudice. Posted by santos. This entry was posted on 20051103 at 1:30 PM You can skip to the end and leave a response. This seemed so promising, too, Santos. Perhaps it's one of those fair foods best left to the fair. the picture hasn't loaded yet, but already my heart is feeling the pain santos. the pain. nic and saff--it's tragic, really. such a waste of calories. It is a sad day, it makes life just that little more complex. anthony--life just more complex carbs. kirk--actually, that might be the way to go. is it those slider type burgers? can you pry them open and dump in more cheese and onions? that sounds like it could be a winner! Oh My! I saw the sign for a Fried Cheesebuger at our State Fair. I didn't try one though. hi j! mmmm, melty, oozy goodness. hi jessica! lovely BOP has a photo of state fair food. when faced with that, i would be overwhelmed and just a little freaked out. maybe look for an apple or something. hi kirk! mmm, squishy cheesy oniony moistness with a deep-fried protective coating? i'd eat it. hi elise! such a waste. but yes, those fries were very, very good. but vaguely alarming has they were so much bigger than the burger, yet the burger was quite substantial. Actually, no. I think my artery just shuddered after a mere glance at it. I agree it is a sad day indeed when the forces of fried are used for evil, not good. And yes, it can and should be good. hi gloop, i hear that the original version is on a stick. now i would like to see that--artery clogger and weapon, all wrapped into one! Do tell - where did you find this OOG item? Inquiring minds want to know! 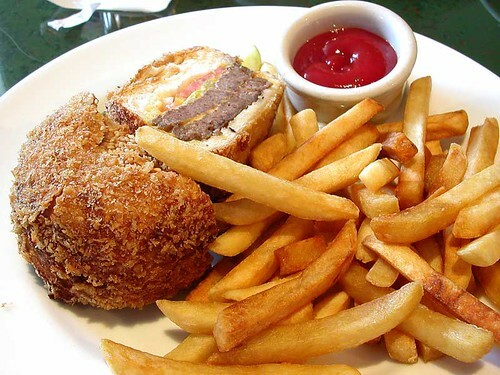 I have never even heard of a deep fried cheeseburger until now. Wow, the world of food bloggers is definately opening up new dishes to me. hi gail! it was a lunch special at sam choy's, of all places. but someone there is fond of fair food, they also have deep-fried twinkies on the menu. i don't think it's sam, though. i hope it's not sam, anyway.